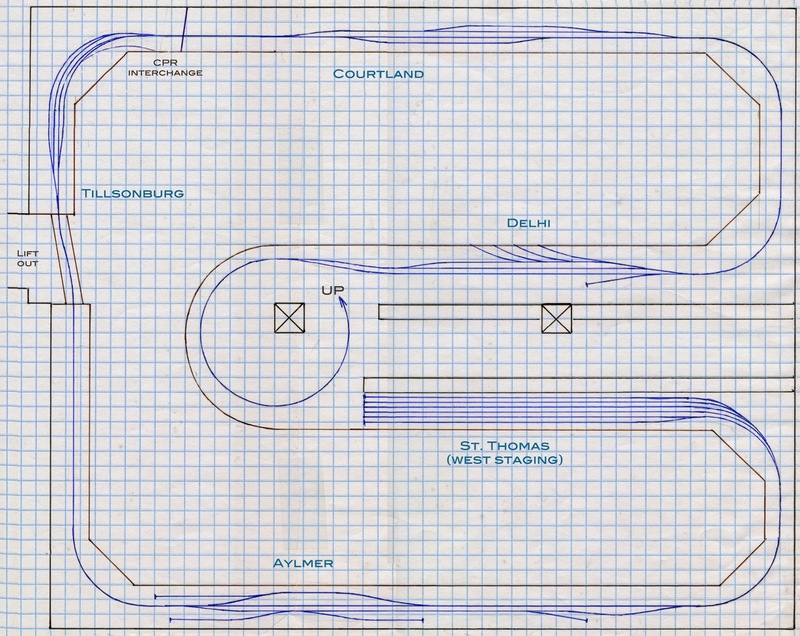 A digital set of drawings of my layout's trackplan. 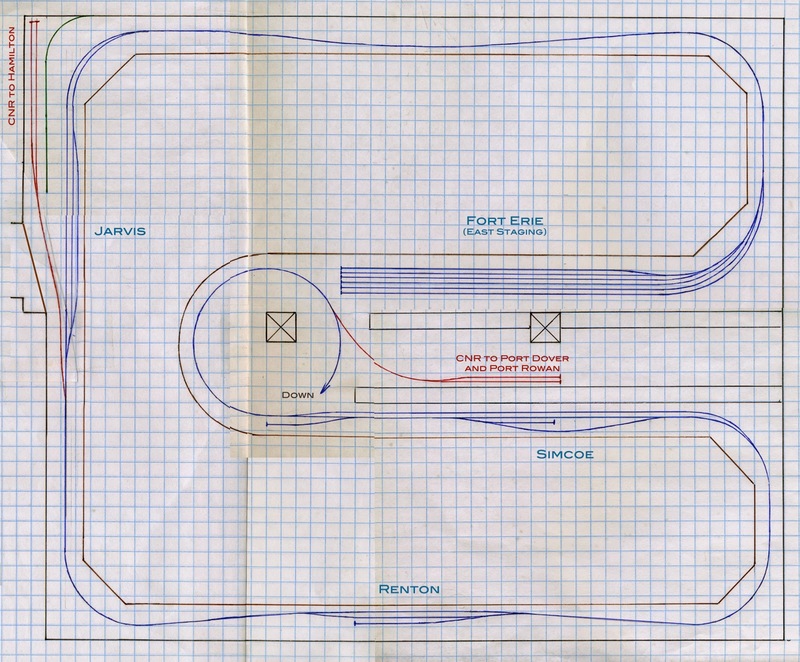 Just spent a day in Toronto with my good friend Trevor, used his computer wizardry to create a digital version of my trackplan. The final motivation for this is the presentation I'll be doing in October at the RPM in Lisle/Naperville . It's been kinda overdue. The graph paper squares represent 6". The standard radius is 30". The distance between the levels is about 16". There's about 2 scale miles of main. Not a lot but it allows me to do what I wanted, run lots of through trains. The track arrangements in the towns was derived from CNR track charts, CNR survey maps and from visiting the towns that still have rail service. Now to build the rest of the presentation. This is the car that is on the bench today. A very early Chooch O scale resin boxcar kit. How early? The instructions offer to honour the warranty until 1988. You do the math. The resin parts come with a prime coat of light grey paint. This is to seal in the stink from the castings that is released when you sand the castings to true them up and make things square. A peculiar mix of diesel and kerosene fumes which soaks into your clothing and hair, and causes the wife to launch a justifiable stream of invective when you arise from the depths of the basement. I've never fought so much with 5 basic castings to try and assemble a car body. The CA just doesn't want to hold the joints together. And the car body really doesn't want to stay square. In the end, though, I prevail. But most peculiar to me is the lack of a roof casting. The instructions direct you to create ribs/trusses/rafters from scrap styrene and then use the supplied piece of sheet styrene for the roof and then to add the carlines from strip styrene supplied. For the life of me I can't understand why the roof wasn't cast in resin. We'll just add it to the list of things I'll never understand. You may be wondering why the roof in the photo is black. The kit supplied sheet of styrene was miscut. It was 2 1/2" wide at one end and 2 3/8" wide at the other. So the only 0.060" styrene I had was black styrene. This car should be done tomorrow and ready for paint. For anyone who thinks that any resin kit that was made in the last 15 years is difficult to build, grow up! We've got it so easy these days and yet battalions of "modelers" won't try a "challenging" kit. Sometimes I despair for this hobby. Particularly with the news today of the apparent end of Carstens and Railroad Model Craftsman. Sigh. When this hobby really gets under my skin. If you've been reading this blog for awhile, you'll know that I own a number of Proto 2000 F7s and a trio of Proto 2000 SW-8s. They are all equipped with DCC and sound. All use QSI decoders. For the most part I'm very happy with the decoders. They sound great and display the unique audio characteristics of the prime movers they represent. My only real complaint with them is that QSI uses a peculiar method of addressing the CVs when you want to really fine tune some of the features that the decoders are capable of. QSI uses what they call an extended addressing system. Rather simply calling up a 2 digit address and changing it's values, you have to perform a certain amount of voodoo to get to say CV 24.80.96 and hopefully change the value to what you want without reprogramming other features within the decoder. I've never been successful with this process, probably because I couldn't find the requisite amount of virgins to sacrifice or I burnt the wrong species of herb. So I left it all alone until after my last ops session when I really wanted to change the speed curves on the F7s. Coincidentally a new product appeared on the market. The Sprog3 . This device, working in conjunction with Decoderpro is supposed to greatly ease the task of programming decoders and is designed to work with the latest operating systems. Called the fine fellows at Sprog. "QSI" they said. "Yeah our stuff doesn't work with their decoders. Sorry." Fine I thought. I'm not easily beaten. I know what I want and I want it now. I contacted those fine fellows at Tony's Train Exchange. I've always had great experiences with those guys, they've helped me out many times. They said "you'll have to buy the QSI Quantum Programmer. It will do everything you want it to." "Fine" I said, "send me one." "We're out of stock right now, but we expect more in a week". "Perfect" I said "here's the credit card info." A month went by and nothing. I called Tony's yesterday. "Where's my order?" I asked. "We have no stock and don't know when we're getting more. Sorry." Today I tried calling QSI. Got through twice, once to sales, once to customer service. Both times an automated receptionist said " Thanks for using our automated service. Goodbye." Send an email, no response all day. Through the website I tried 3 hobby shops looking for stock. 4th times a charm. Found one. It's ordered and on the way. Why do companies make it so hard for me to give them my money? The line of etched detail parts continues to grow at Yarmouth Model Works. 3 new etched stirrups are now available. Each fret retails for $3.00 and has enough pieces to do 4 cars. Ordering information is on the website. Now Joe, along with everybody else, is entitled to his opinion. But as an editor of a major publication it is Joe's responsibility to try and be all things to all people, and not trash talk the efforts of some. To call the promotion of superdetailing a "disservice" to the hobby is nothing short of insulting to people like myself who have worked very hard over the years to become as good as we are at our chosen craft. There are a large number of model railroaders who happily populate their layouts with less detailed rolling stock. That is their choice as to how they wish to enjoy this hobby. And that is the beauty of model railroading, there's room for every one. I've seen beautifully sceniced layouts that have old Athearn and MDC rolling stock sharing space with more modern better detailed cars. For me the presence of the door claws and stirrups that appear to have been made from 6" x 6" are an eyesore. But I would never say anything about it to the layout owner. He's worked hard and is proud of his creation. Who am I to tell him he's doing it wrong. A friend participates in a modeling podcast where someone once referred to prototype modeling as a cancer on the hobby. His opinion and he's entitled to it, but I don't think it's appropriate to insult prototype modelers on the airways in that manner. There's enough strife and struggle in the world these days as it is. Do we really need editors of popular magazines spreading dissension? I produce a very high quality line of resin kits for those who wish to own them. I sit in judgement of no one when they buy them or when they pass them by. The market will decide whether or not my business survives. The higher detailed offerings certainly must have a market because they keep getting produced and they seem to be bought. Guess all those buyers are doing a disservice to the hobby. 4 Vinegar tank cars ready for service. That's a lot of pickles. I tossed the kit supplied handrail stanchions and the cast "pipe elbows". I used Precision Scale stanchions. They look far nicer and are quicker and easier to work with. The elbows supplied would have been great for 9" diameter pipe rails. I opted just to bend the wire. 2 of these are going to be shipped to the customers and the other 2 will be sold on Ebay. In fact I just listed the first one. Item number 321480673886.